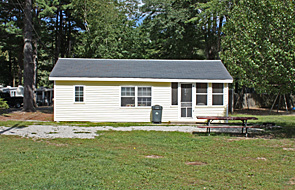 Sanborn Shore Acres contains 136 campsites, exclusively dedicated to serving the needs of seasonal campers. 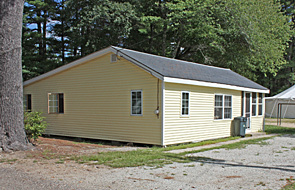 Each site features metered electricity, well water, sewer hookup and digital cable TV. A boat ramp and docks are also available, at an additional fee, for campers who would like to dock or launch their own boat on Big Island Pond. 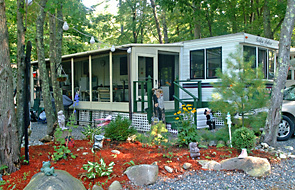 We also offer a wide ranging activities schedule which caters to the interests of seasonal campers. Be sure to view our site map in order to get a feeling for the size of our sites and the layout of the campground, as well as the proximity of various sites to the beach, restrooms and the other campground amenities. Seasonal Rate includes water, sewer and cable TV. Sites are metered electric. Rates are based upon 2 adults and up to 3 children, 18 years and under. 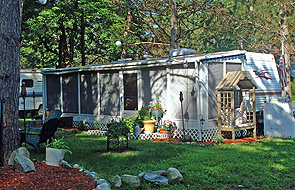 Off-season trailer storage at no charge to returning seasonal campers. Our seasonal sites are full for the 2017 season, and we are now accepting requests for the 2018 season. Fees doubled on holiday weekends. Children visiting their parents on Mothers Day and Fathers Day, visit for FREE! Click here for a more complete set of visitor rates and rules. Our seasonal sites are nearly full for the 2019 season. Our seasonal rate for the 2019 season will be $3,650.00. Our 2019 Seasonal Site Application Form is now available in PDF format by clicking here.